It happens to all of us. One day you wake up, look in the mirror, and realize that the once youthful skin you had has all but disappeared. Years of emotion – happiness, sadness, pure joy, tragedy, ecstasy – are all laid out on your face. And although those moments in life are reason to celebrate, sometimes you want something to help restore your face to the time when those memories were made. 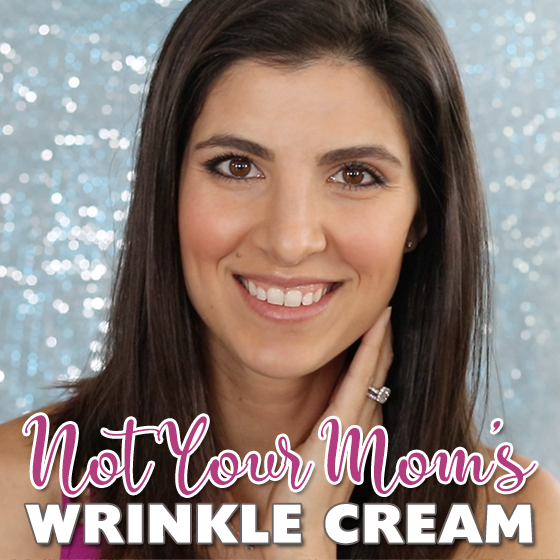 If you’re like most of us younger, middle-aged moms, we have fond memories of watching our mothers apply layers of “wrinkle cream” to their faces before climbing in to bed for the night. But science has evolved, ladies! 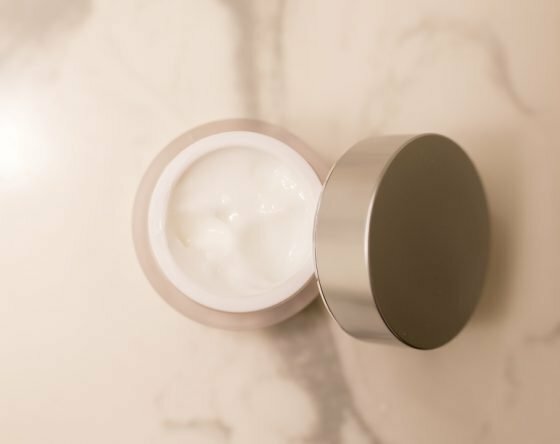 Read on to learn about some top ingredients (and our favorite products) that will keep your skin looking youthful and refreshed – even though you may not always feel like it. It seems like once the clock ticks into your 30’s, your skin and skincare regimen may change. You may suddenly suffer from dry and flaky skin, compared to the oily and acne prone skin you had in your 20’s. 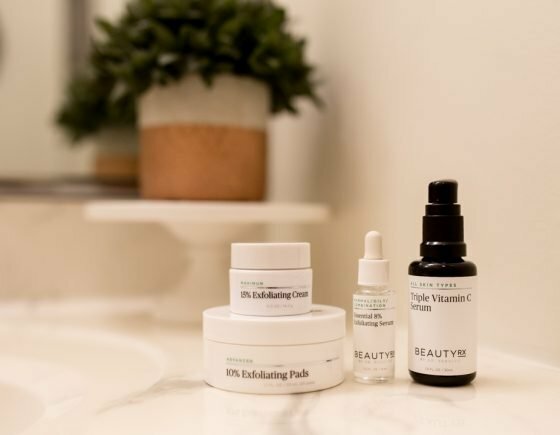 No matter what age and skincare ailments you may have, we’ve rounded up some new and innovative products on the market today, with amazing ingredients that will help get you the results you’ve been looking for. 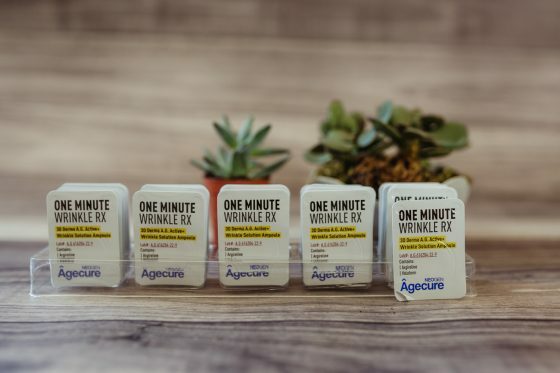 But first, let’s have a chat about some ingredients you may see inside your anti-wrinkle skincare products, and why they are beneficial to your skin. Vitamin E is found naturally in foods and is commonly known to promote healthy skin. It has antioxidant properties which help slow down the damage of cells from free radicals — substances that roam your body, stealing oxygen from cells, causing them to break down faster. Vitamin E works against the destruction that these free radicals have on your body. For your skin, this means a more youthful appearance — Vitamin E slows the aging process and reduces wrinkles. It is also widely used to moisturize, nourish, and rejuvenate the skin. It can be used to treat the look of scars and prevent dry skin, which is one of the leading causes of wrinkles. Polyphenols are found in things such as green and white teas, olives and grapes, and are known as catechins. Like Vitamin E, polyphenol isn’t just one thing, but rather the general name for a group of compounds that act as antioxidants. One of these compounds is called resveratrol — the high-performance natural active ingredient found in grapevines, used to naturally defend itself. Numerous scientific studies have confirmed that resveratrol is an effective anti-aging ingredient. Studies have also shown that polyphenols can protect against ultraviolet radiation as well as enhance skin cell growth. By applying polyphenols topically, you’re not only giving your skin protective benefits, but improving the overall skin quality by increasing blood flow and oxygen to the skin. In addition, polyphenols help retain moisture in the skin, which slows down the aging process by fighting wrinkles. Collagen production decreases as you age, causing your skin to become drier, weaker, thinner, and less resilient. By 30, your skin loses about 1.5% of natural collagen, and by 40, 15% is lost. This leads to fine lines, wrinkles, and sagging skin. Collagen can slow this process by strengthening the skin and improving its elasticity. Believe it or not, collagen is the most abundant protein in your body. It helps support the structure of your skin, making it appear smooth, supple, and wrinkle free. When left on your face, collagen will hydrate and tighten the skin, giving you a mini facelift. Hyaluronic acid — although it sounds like a scary ingredient that might wreak havoc on your face, it is actually very beneficial to your skin. Hyaluronic acid is naturally present in the body, acting as a cushion and lubricant in the joints and other tissues. In beauty products, it not only hydrates the skin but gives the skin the ability to lock in your skin’s natural moisture, which nourishes the skin and aids in slowing the aging process. If you have severely dry skin, look for products that contain a high amount of hyaluronic acid; this will quench your skin’s thirst, allowing you to get the most out of your product. 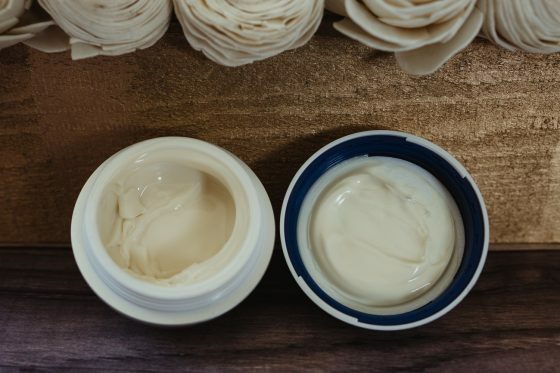 Now that you have a better understanding of some common ingredients found in wrinkle cream, let’s take a look at some top favorites that will leave your skin feeling fresh, nourished, and rejuvenated. Bioelement’s provides skin care products for the professionals. You can schedule your anti-aging facial using their products at a spa near you. No time for an anti-aging facial? No problem! Bioelements Professional Skin Care offers their spa caliber products directly to you for use right in your own home! Your skin is exposed to toxic pollution every day, which causes it to lose elasticity and can lead to premature aging. Yuck! Remineralist Daily Moisture delivers hydration to your face and defends against atmospheric stressors that cause fine lines and wrinkles. It replenishes your skin’s pollution-depleted minerals to achieve younger-looking skin. Studies have shown that it increases your skin’s moisture content up to 70% in 15 minutes. 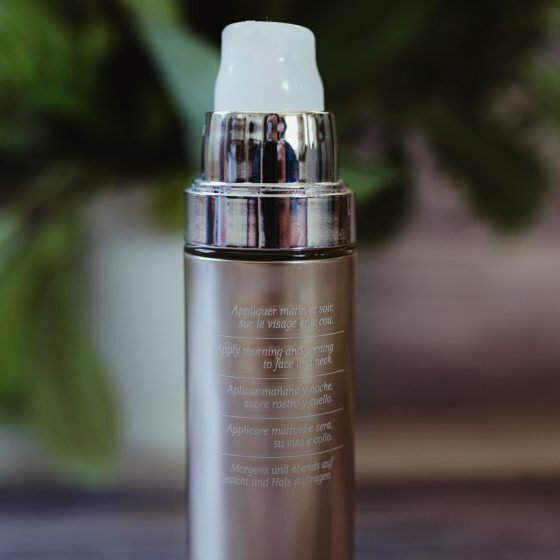 The unique pump design for this moisturizer features an anti-return air system to protect the formula from oxidation and maintain maximum performance and freshness! All types of skin. Oily or combination skin types can use it alone, while it could be applied to dry skin over a serum. Apply this to your entire face and neck each morning after cleansing. If you’re looking to bring back your youthful radiance, Power Peptide is a great place to start! 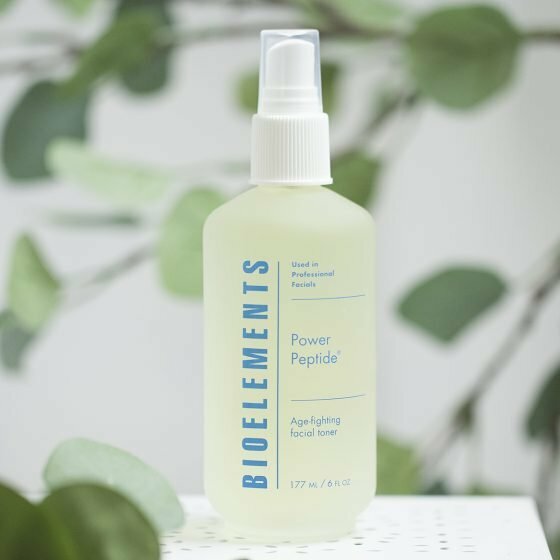 This facial toner revitalizes skin with renewing peptides and fights the signs of aging by boosting moisture and brightening your skin. It works to keep the surface of your skin moist and hydrated for a younger-looking appearance. After cleansing, close your eyes and spritz all over your face and neck. Massage into your skin and apply your next Bioelements product. 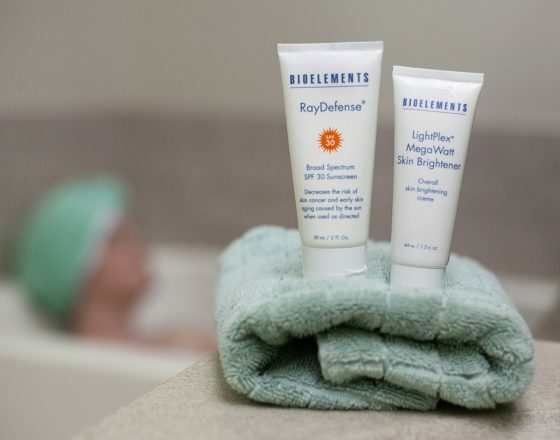 Brighten dull, damaged skin with the Brilliantly Brighter duo. LightPlex MegaWatt Skin Brightener is an antioxidant moisturizer that brings clarity back to your skin by reversing discoloration, hyperpigmentation, and UV damage. RayDefense is a hydrating broad spectrum SPF 30 sunscreen that protects your skin from further damage. Apply evenly to your entire face every morning and night. Never skip the sunscreen! Soften and hydrate your skin while you sleep! 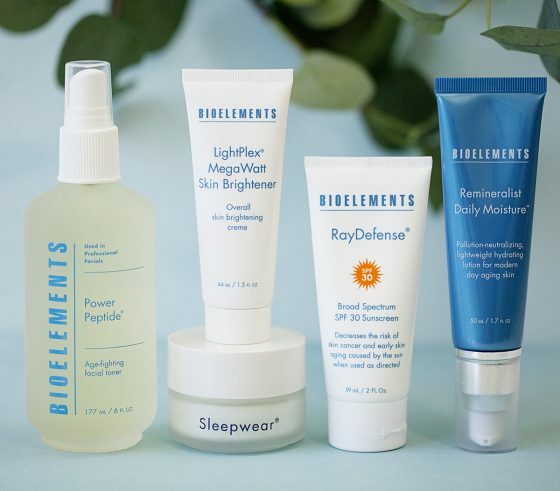 When you close your eyes, Bioelements Sleepwear goes to work to smooth the appearance of lines and wrinkles and dramatically improve moisture and tone. The unique formula wakes up dry skin and leaves it replenished and energized. Skin appears more rested and ready to face the day when you wake up! Apply a small amount to your face and neck before bedtime. Bioelements has remained a family business since it opened more than 25 years ago! It began in 1985 when Barbara Salomone (one of the first-ever licensed estheticians) changed the progessional skin care industry by opening her first advanced learning center. Soon, Bioelements became known for offering the most up to date education on skin care. After that, their line of professional skin care products launched in order to provide estheticians with products and treatments that would make a major difference in the appearance of the skin. 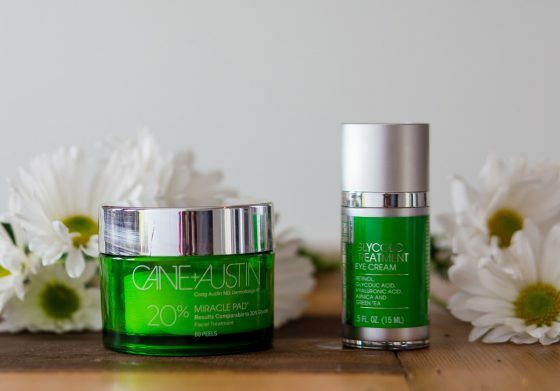 When considering the best products for your skin as you age, Cane +Austin absolutely needs to be on your radar. 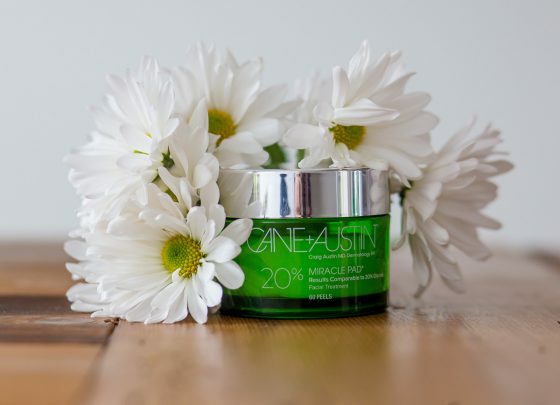 You will find that their Miracle Pads are truly a miracle in a jar. These individual pads are an intensive at-home facial peel that has been clinically proven to even your skin tone while building collagen and visibly reducing the appearance of age spots, fine lines & wrinkles. There are different versions of the peel which offer you different levels of Glycol Acid. 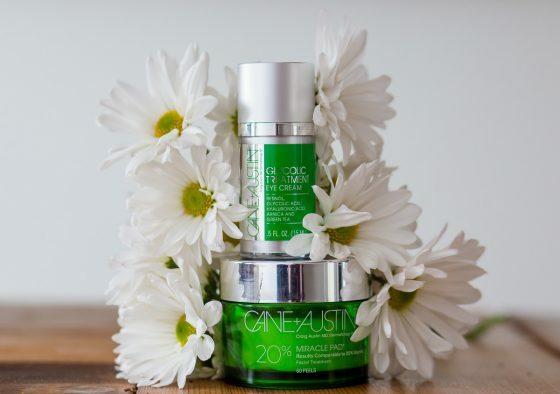 All of Cane + Austin’s skincare products are formulated with a unique Glycolic Acid that is derived from sugar cane. These products are free of both parabens and fragrances. Great for all skin types. For acne prone skin check out their Acne Retexture Pads. Each morning and evening, swipe pad over clean face, avoiding the eye area. For sensitive skin, use once daily for the first week, then increase to twice daily. A tingling sensation may occur and is normal. The delicate area around your eyes always needs extra special attention. 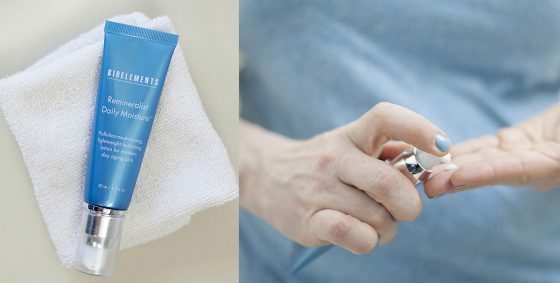 Cane + Austin’s Eye Cream features Medical Grade Glycolic Acid, combined with Arnica, Green Tea, and Hyaluronic Acid to reduce signs of aging specifically in the eye area. It also works to reduces fine lines, puffiness and hyper-pigmentation while still providing ultimate hydration. 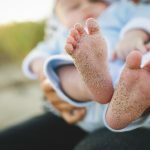 All skin types can benefit from occasional exfoliation. Dry and/or sensitive skin may not want to use this product as often. Oily/combination skin can use up to once a week. Apply ½ Pump around eye area up to two times daily. Cane + Austin strives to go above and beyond most Doctor Brand skincare by using the superior benefits of sugar cane Glycolic Acid. They aim to offer high quality at home treatments that really work on all different skin types. 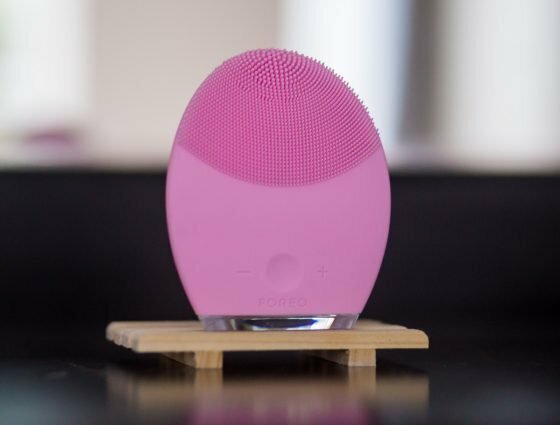 The LUNA 2 by Foreo is a compact cleansing and anti-aging device that is essential in your rotation. This revolutionary device is an enhanced T-Sonic facial brush and anti aging system that helps to eliminate blemishes and also addresses your aging skin. With two different sides, one side is for gently exfoliating dead skin cells and unclogs pores of makeup residue to remove up to 99.5% of dirt and oil and in turn helps to eliminate breakouts. Flip this bad boy over and the opposite side uses lower-frequency pulsations which will help to visibly reduce forehead wrinkles and fine lines around the eyes and mouth. This will leave your skin looking firm and lifted and help the absorption of all of your skincare products. All Skin Types-The LUNA 2 is now available in four varieties, so you can select the one that is tailored to your skin type. Use the LUNA 2 every night and make it a simple two minute part of your cleansing routine along with your favorite cleanser. Once you have washed your face you can apply moisturizer and use the anti-aging side. 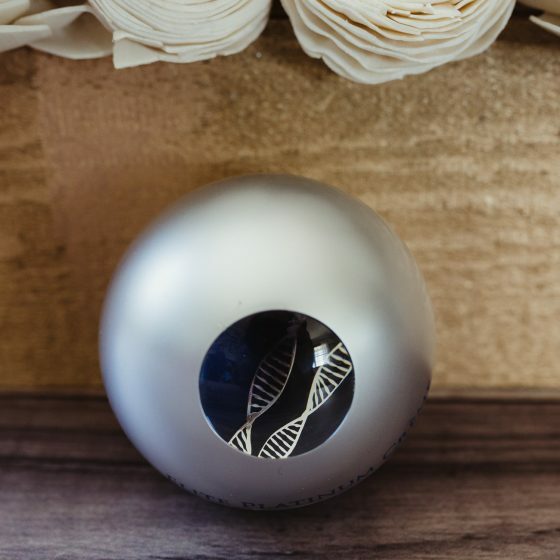 If your delicate eye area is in need of a serious pick me up that just hasn’t been solved by eye creams you need the IRIS illuminating eye massager. Everybody wants eyes that look and feel refreshed. With the everyday effects of stress, exhaustion and aging going straight to the area around your eyes, they often need extra attention. 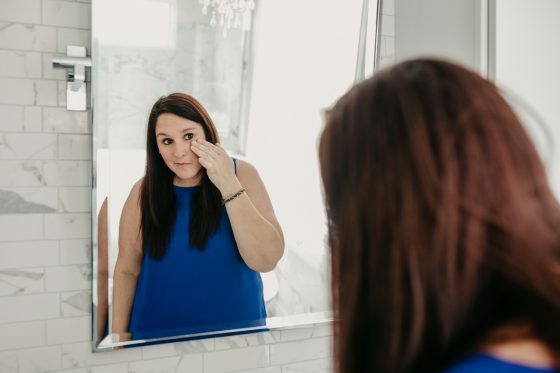 The IRIS targets this delicate area with its soothing Alternating T-Sonic technology which helps to gently fades the signs of dark circles, crow’s feet, and bags under your eyes. Skin that is showing signs of aging around the eyes, or anyone whose eyes need a serious pick me up. 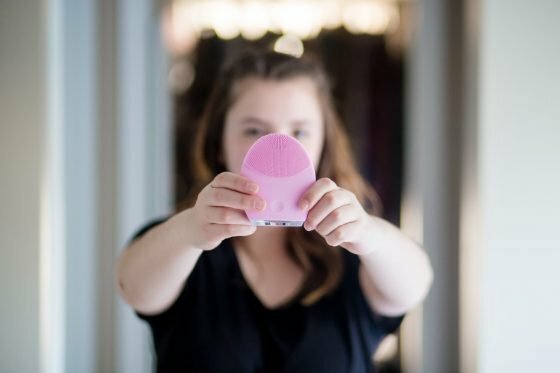 You will want to break out your Foreo Luna every morning and night when you wash your face. 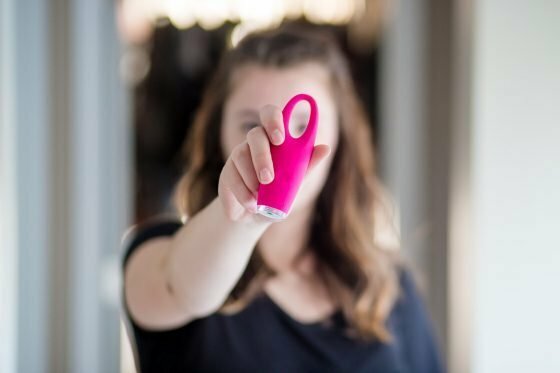 Foreo has tasked themselves with the mission of brightening your life. They are aware of how profound of an impact the way you feel has on how you approach your own wellbeing as well as the whole world. 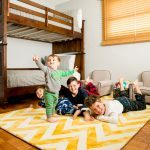 They are providing products that help promote self confidence. They want you to feel that extra pep in your step when you step out the door. After all, when you look good, you certainly feel good! 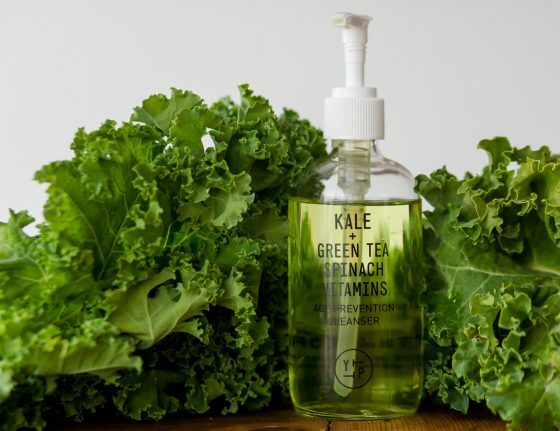 The Kale + Green Tea Cleanser is an innovative age prevention cleanser that is packed full of nutrients and designed to help balance your skin while protecting it from free radicals and the environmental stressors that take a toll on your skin. Using this cleanser daily will remove dirt and toxins while packing the powerful punch of the antioxidant power of kale, spinach and green tea. Kale provides your skin with high levels of phytonutrients, Vitamins A, C, E and K while the green tea provides you with polyphenols and spinach loads you with antioxidants and helps protect you from the sun. Use as your staple cleanser in both the morning and evening. A solid cleanser is essential but sometimes your skin needs a little bit more. 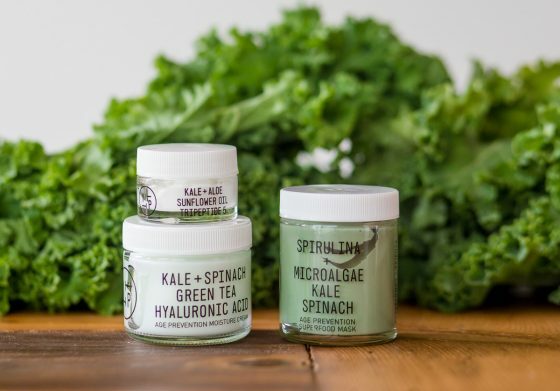 Complete your natural and effective skin care routine with the Kale + Aloe Sunflower Oil Eye Cream, Kale + Spinach Green Tea Lotion and Spirulina + Microalgae Mask. 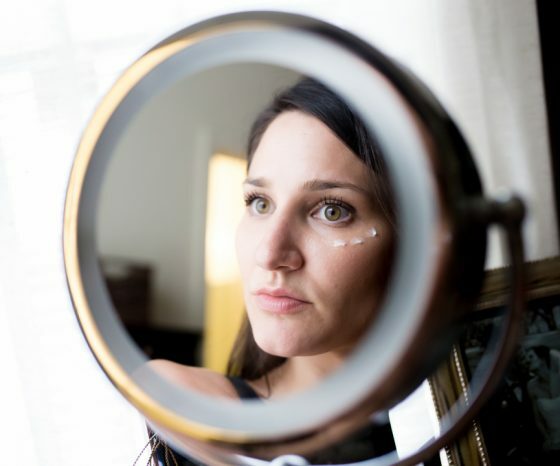 This eye cream may be small but it packs a mighty antioxidant punch. By delivering the power of superfoods and science to your eyes you get a hefty dose of vital nutrients through the proprietary superfood blend and you also get the emollient sunflower oil which moisturizes and packs even more vitamins. 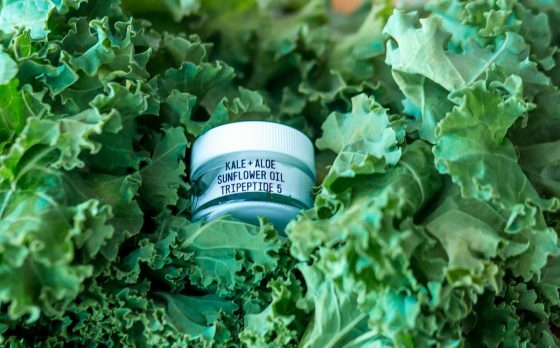 The Tripeptide 5 found in their eye cream is proven to help reduce fine lines and wrinkles, boost collagen, improve elasticity and prevent the signs of aging while the Crosslinked Hyaluronic Acid plumps and locks in your skin’s natural moisture. 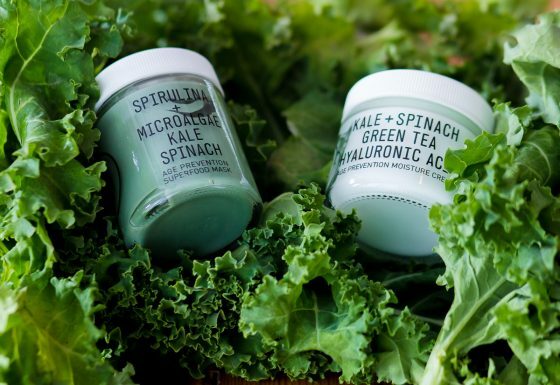 The Kale + Spinach Green Tea Lotion restores and rejuvenates while it protects you from free radicals and you absolutely need the Spirulina + Microalgae Mask is loaded with superhero greens from both the land and the sea. Backed with the power of spiraling, algae and a superfood blend along with Hyaluronic Acid to drench your skin in moisture, you will feel the plumping and hydrating effects on your skin immediately. Normal and combination skin and perfect as an anti-aging line. Daily, after cleaning your skin gently apply the lotion and the eye cream with clean fingers. Use the mask as a weekly pick me up or as needed. YTTP’s approach to skincare is to combine the best of science and the best of nature to provide natural products that pack a serious punch. 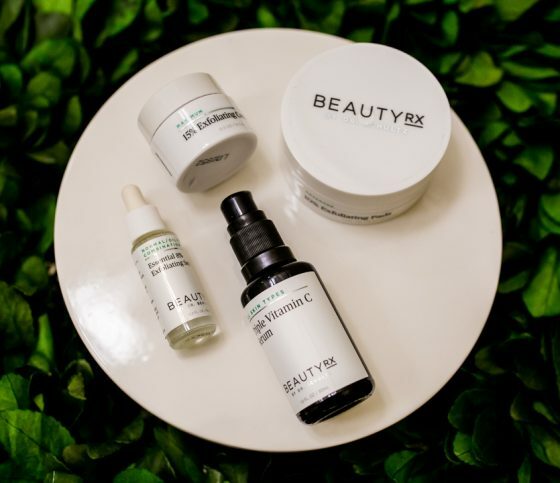 Inspired by their grandma who was a pioneer in esthetics in the 80s, brining natural and botanical ingredients into the U.S. Professional skincare industry, she was a trailblazer and they have followed along in her footsteps. 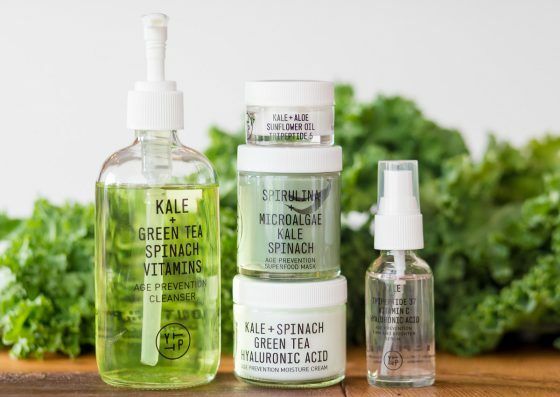 They create products that are 100% vegan ingredients using cold-pressed extracts made in the USA that contain no fragrance, no parabens and no added colors. They go the extra step of not testing on animals and they offer gorgeous and recycled packaging. 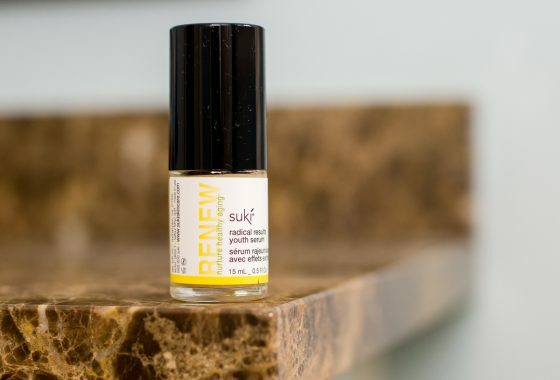 Suki Skincare offers a powerful anti-aging serum. It is called the Radical Results Youth Serum and the name says it all. You will get amazing results from this little bottle of skincare magic. It is packed full of vitamins; in fact, it contains more vitamins than any other of Suki’s serums. Fine lines and other signs of aging will be reduced. With an advanced collagen extract, elasticity is improved. Your skin will be toned and strengthened. The star of the show in this serum is the high potency rose concentrate. Suki makes it on site, from organic roses, triple-filtered and extracted for extra potency. It matches the skin’s chemistry and pH making this serum perfect for everyone. No irritation and all results from the Radical Youth Serum. While dewy from toner, massage 1 to 2 drops before or with suki® moisturizer of choice into your face and décolleté. Suki’s Exfoliate foaming cleanser was formulated to truly exfoliate and rejuvenate your face. Not only does this product leave you with incredibly smoother skin, it also solves common skin care woes like blemishes, dry and uneven skin tone, slowed collagen production, signs of fine lines and wrinkles, premature aging, and clogged pores. This cleanser exfoliates so well because it uses round-edged sugar crystals to slough dead skin without tearing your smooth and even skin. The sugar then melts into pure AHA for healthy skin renewal. When you use this product, the scent is invigorating. The citrus scent, made up of lemongrass, sweet orange, and other pure essential oils seriously smells so yummy that you could eat it. Once you resist the urge to take a taste and actually scrub your face, you will step back from the sink with skin that feels smooth and new! The results are obvious immediately. Wet hands and blend a very small amount between palms to activate and customize action. Massage onto face and décolleté once a day (morning or evening) or 2-3 times per week based on sensitivity. Remove with moist suki® facial cloth. 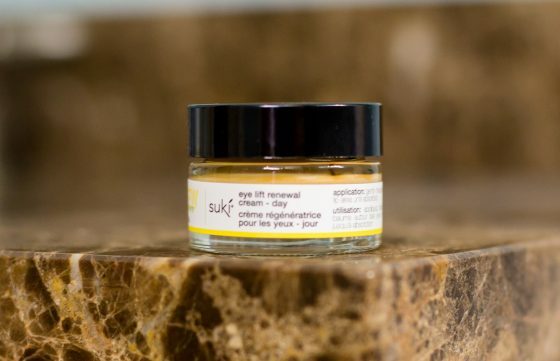 Suki’s eye lift renewal cream is what your aging eyes need during the day. Banish puffiness, redness, fine lines, and wrinkles. 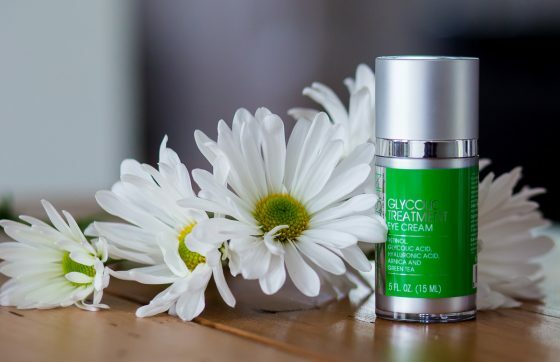 This cream is a tired mom’s dream come true. No one will know you were up all night trying to keep the kids in bed because your eyes won’t give you away. The powerful ingredients in this cream retain moisture, improve elasticity, brighten and even tone, and reduces wrinkles, redness, and puffiness. Gently massage small amount around delicate eye and even lip area until absorbed. 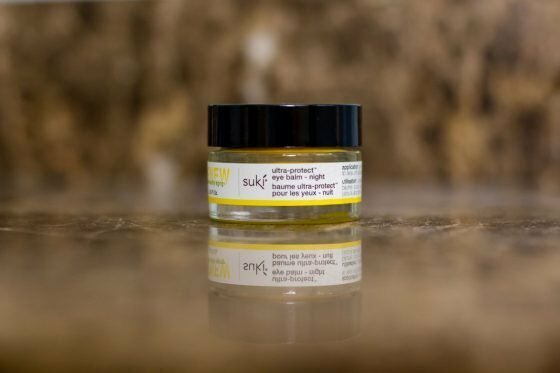 Suki’s Ultra-protect Eye Balm is moisturizing and will renew your eyes while you sleep. The botanicals and nutritives pack an intense moisturizing punch. In the morning, your eyes will be softer, refreshed, and renewed no matter how many times the baby wakes you up. If your skin is dry, you will love this balm as it takes away all signs of dryness and dehydration. 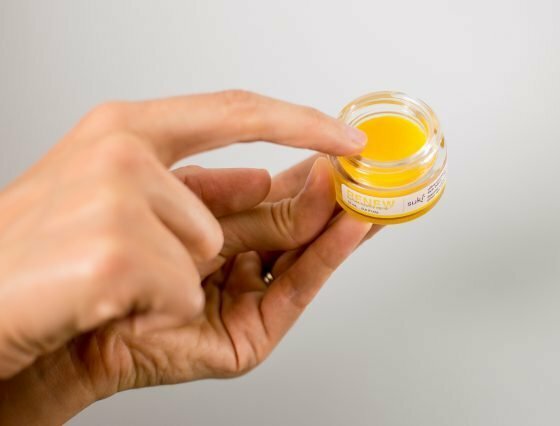 The skin around your eyes is so delicate and this balm is healing every time you use it. It is over 80 percent organic. 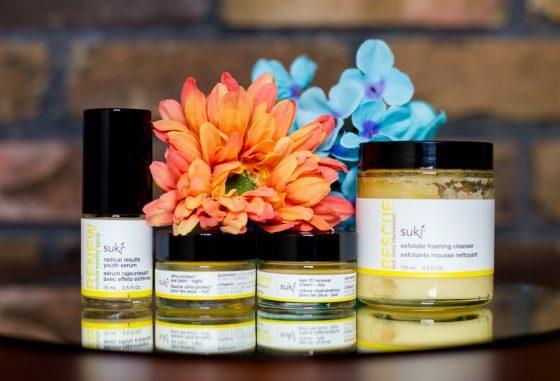 Suki Skincare is all about solving your skin problems effectively with strong and safe solutions. Many people are stuck in a damaging cycle of using skincare that contains volatile synthetic actives that actually cause many skin problems. Suki believes that actives do not need to be hostile to your skin in order to work. 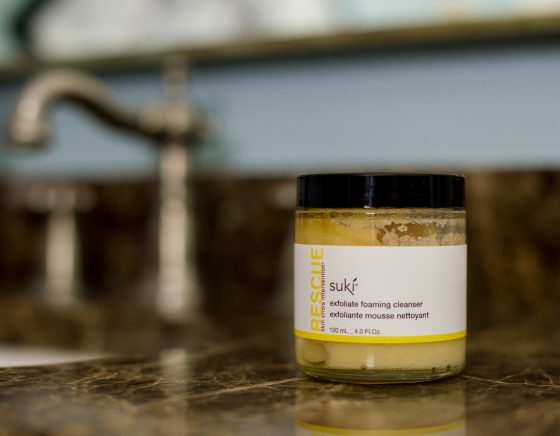 Through extensive clinical trials, Suki develops products that really work and are 100% natural. Responsibility in packaging is also important to Suki. 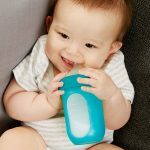 You will find that most of their products come in glass containers and you can recycle their packaging. 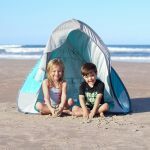 This company is the real deal when it comes to being safe for you and the environment. You can rest assured that all of Suki’s products are safe and nourishing, never containing chemicals known to cause cancer or effect cancer treatments like many mainstream cosmetics. Smoother, brighter skin is only 6 weeks away with this 5 star reviewed beauty system! 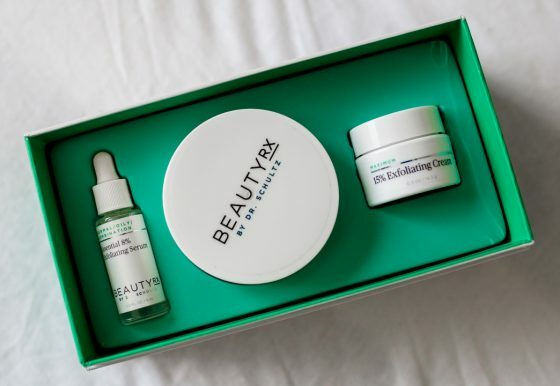 The Progressive Peel Kit by BeautyRX by Dr. Shultz is certainly not your mother’s in-office chemical peel – ouch! 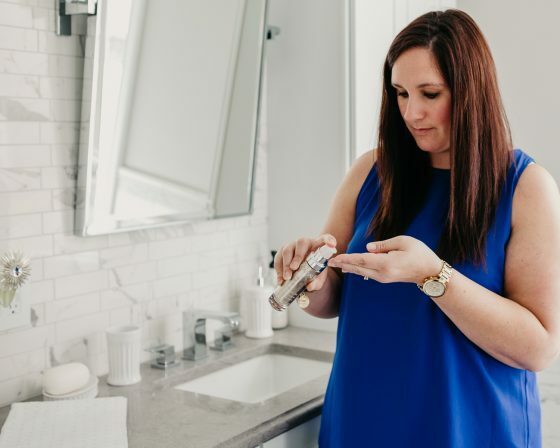 Instead, you can fight the signs of aging – dull skin, discoloration, large pores, and more – from the comfort of your own home, with an easy, painless routine. The kit contains Advanced Exfoliating Pads, Exfoliating Cream, and an Exfoliating Serum. Dr. Shultz’s unique formula allows you to renew and replenish your skin without any redness, downtime, or irritation. Weeks 1-2: Apply the Exfoliating Serum (4-6 drops) to lightly cover your face. Weeks 3-4: Swipe an Exfoliating Pad across your face, avoiding your eyes and lip area. Weeks 5-6+: Evenly apply a pea-sized amount of the Exfoliating Cream to your face. Vitamin C has long been hailed as THE skin revitalizer, boasting brighter skin and a smoother complexion by fighting aging and free radical damage. 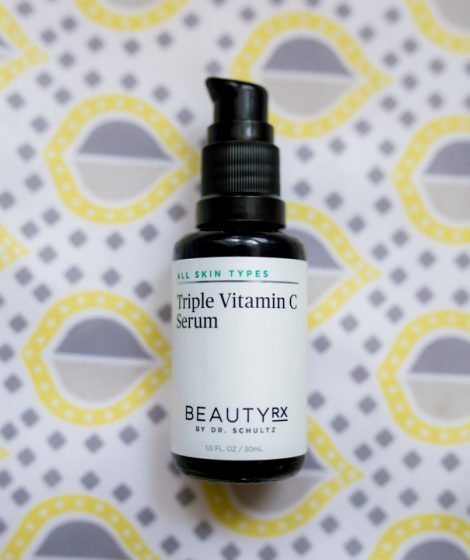 The Triple Vitamin C Serum by BeautyRX by Dr. Shultz does just this! Containing an Antioxidant Serum with three potent forms of Vitamin C, 100% of users claimed brighter, softer, more youthful skin overall. Vitamin C has also been proven to lessen the appearance of hyper-pigmentation and dark spots. Use nightly after cleansing your face. Apply sparingly. For the past 35 years, board-certified NYC-based dermatologist, Dr. Neal Shultz, has been helping people get – and maintain – the skin they’ve always wanted. Dr. Shultz combines his years of experience and the desires of the consumer to provide high-quality beauty products that can be used in your own home. Hailed as “Top Doctor” by New York Magazine, Dr. Shultz believes in educating as well as providing the best in skin-health products through his website, offering answers to your most intriguing skin questions, as well as skin care tips and guides. 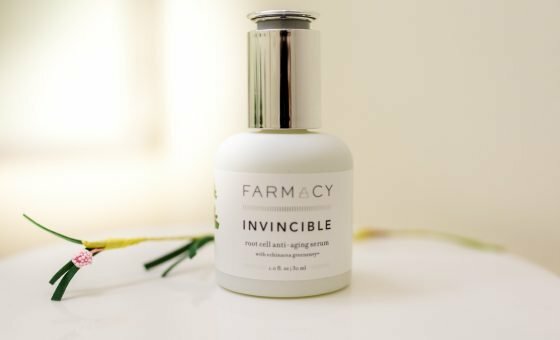 The Invincible Root Cell Anti-Aging Serum with Echinacea GreenEnvy is the ultimate in anti-aging serums. 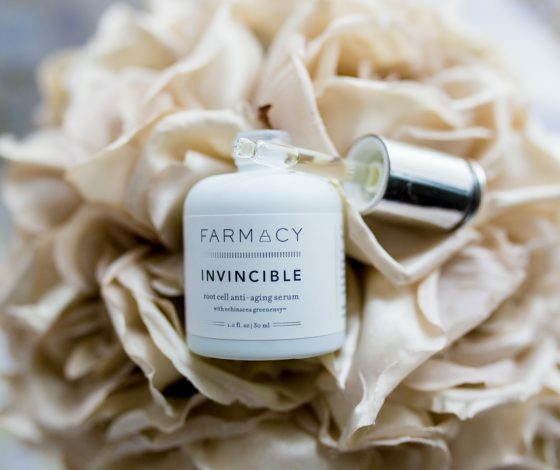 Packing a punch, the Invincible serum includes specialized ingredients that fight off the enzymes that break down collagen, reduces the appearance of freckles, dark spots, and sun damage, and promotes the formation of anti-oxidants, collagen, and elastin. 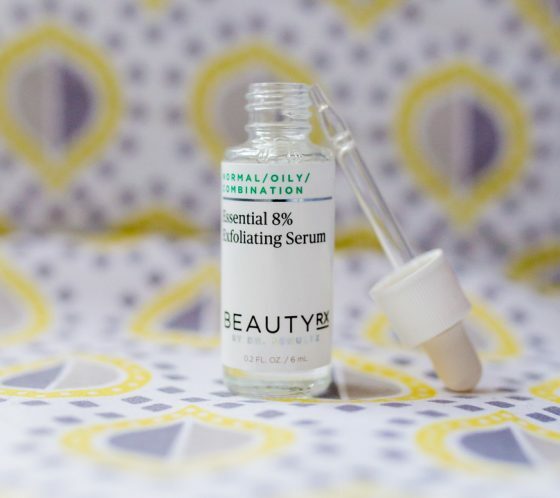 This silky serum delivers the ultimate in hydration and radiance while reducing fine lines and wrinkles with its unique triple hyaluronic acid complex. Invincible also promises to even skin tone and create a healthy, glowing appearance overall. Warm one dropper dose between the palm of your hands and gently press into skin from forehead to chin and neck. Use morning and night on a clean face, before following up with a daily moisturizer. Dewy skin is everything when it comes to the appearance of younger looking skin. 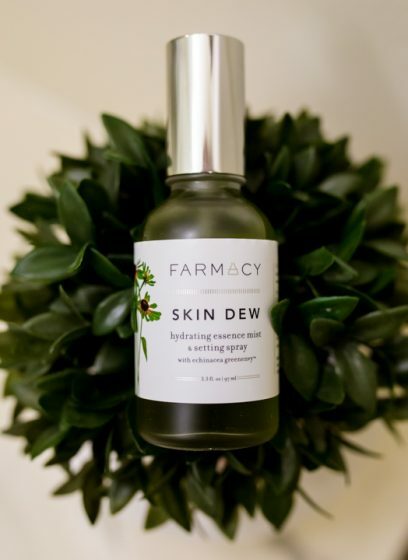 Farmacy’s Skin Dew Hydration Essence Mist & Setting Spray with Echinacea GreenEnvy is exactly that: everything. 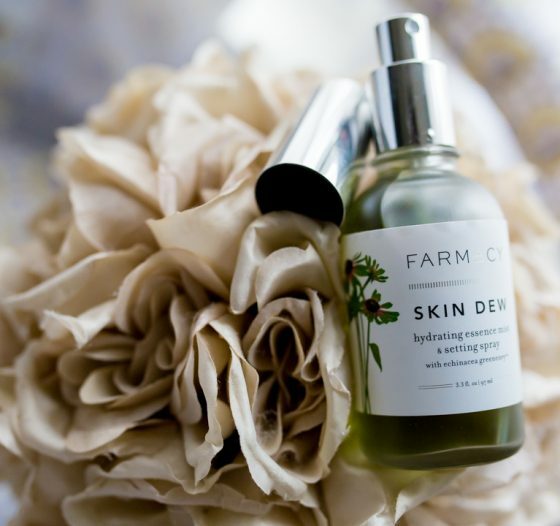 Skin Dew blasts a delicious (this stuff smells A-Mazing!) hydrating mist that not only sets make up, but restores the skin’s appearance, making you look fresh and perfected. Hold nozzle approximately 8 inches from face and spray. Spray after cleansing and before moisturizing, and after applying makeup. Refresh throughout the day as desired. If you are looking for a face revitalization, look no further than Farmacy’s Honey Potion Renewing Antioxidant Hydration Mask with Echinacea GreenEnvy Honey. 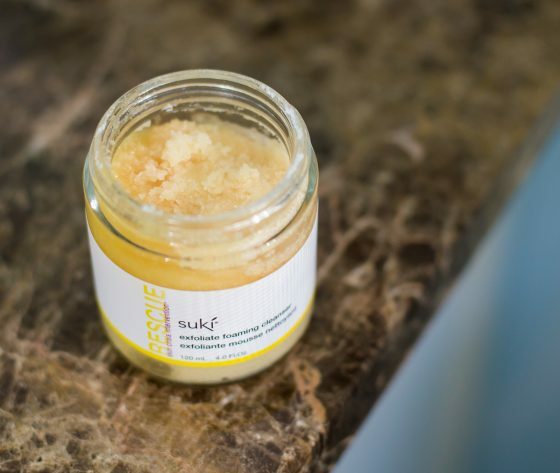 This super dense and smooth honey facial mask warms into a cream as it is massaged on the face, nourishing and revitalizing the skin with GreenEnvy honey, propolis, amino acid rich royal jelly, and essential B vitamins. The jar also comes with a handy magnetic lid and spatula, so application is always easy and clean. After cleansing, use the spatula to scoop a small amount and spread across the face from forehead to chin. 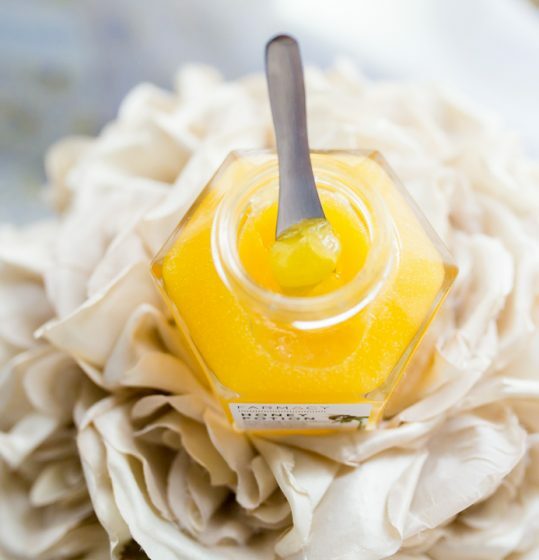 Gently massage the honey potion for 1-2 minutes while it warms and turns into a cream. Leave on for 10- 15 minutes and then rinse off. Can be used morning or night. 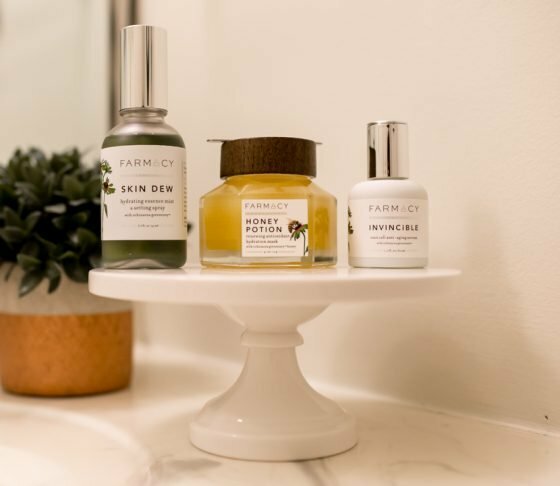 Farmacy is a farm to beauty counter company. 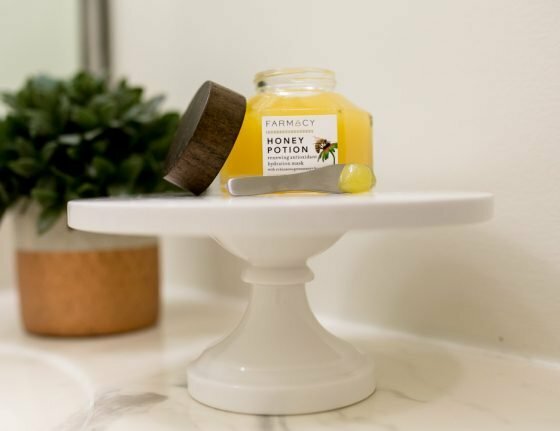 Using fresh, natural ingredients and the most up-to-date, cutting edge technologies, Farmacy creates health and beauty products that are naturally grown and scientifically activated to enhance all that nature has to offer for your skin. Their products are irritant-free and contain a unique variant of Echinacea GreenEnvy, a plant that “contains a high concentration of the phytochemical Cichoric Acid, a potent natural antioxidant which helps protect and firm the skin by inhibiting the enzymes that break down collagen.” Consumers can feel good knowing that they are using the highest quality, naturally-derived ingredients, free of parabens, formaldehyde, and artificial coloring, as well as cruelty-free. The Premier Cru The Cream is a moisturizer and serum in one, delivering ultimate anti-aging benefits and protection for youthful, supple skin. Use this luxurious cream to smooth wrinkles, firm the skin, diminish dark spots, define your natural facial contours, brighten the complexion, and even out your skin tone. You’ll feel like you’ve just visited the spa with the lingering scent of vine roses smoked in an oak barrel. This formula is free of parabens, phthalates, mineral oils, phenoxyethanol, sodium laureth sulfate, and animal ingredients. Apply morning and evening to your face and neck in gentle, upward motions. A little goes a long way, and the velvety texture melts beautifully into your skin so it won’t leave you feeling oily. Mathilde and Bertrand Thomas, a wife and husband duo, are the creative minds and founders behind Caudalíe. In 1993, the idea and inspiration for Caudalíe’s exceptional products was born in Bordeaux, France at the heart of the vineyards on their family estate. With the help of Professor Joseph Vercauteren, one of the world’s specialists in Polyphenols, Mathilde and Bertrand realized the effective powers that the grapes and vines possess when it comes to skincare. In 1999, they discovered a hot spring under the estate and began combining the revitalizing, beneficial effects of the water to create unique spa treatments. Being in the natural setting of the vineyard, they find daily inspiration for their products. 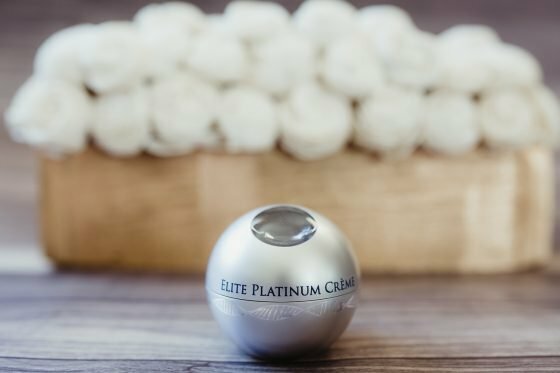 The Elite Platinum Crème is the most luxurious anti-aging face cream from Elite Therapeutics. Designed to boost the skin’s natural elasticity to provide firmer, smoother skin with a youthful radiance, this product uses Apple Stem Cell Technology, clinically proven to reduce the size, depth, and intensity of wrinkles. 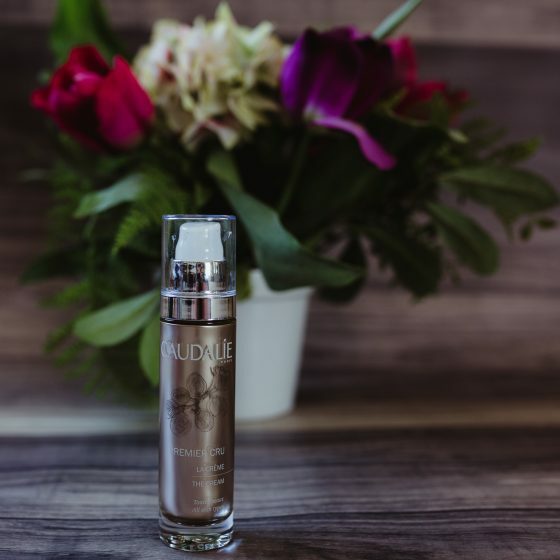 Elite Platinum Crème combines this technology with its patented protein-peptide blend and five times the water binding capacity of regular hyaluronic acid, specifically formulated to deliver deep hydration while restoring the skin. This formula is physician formulated, safe for all skin types, and free from parabens, fragrances, and animal cruelty. Use in the morning and evening for best results. To apply, massage gently onto face and neck, smoothing along the natural contours of the face. Dab lightly under eyes from outer to inner corners. Reapply if additional hydration is needed. Elite Therapeutics was created by Dr. Kevin Schewe, a passionate and driven healer who has devoted more than 25 years to fighting cancer. Seeing the ravaging effects that radiation and chemotherapy can have on skin and hair, Dr. Schewe has dedicated himself to making a difference in these cancer patient’s lives. His personal mission is to help them feel beautiful on the outside, even though they are fighting for their lives internally. When he began testing ingredients and formulations, optimal healing efficacy was his number one priority. He searched for ingredients that would deliver immediate relief as well as deep cellular nurturing, for sustained, long-term healing. 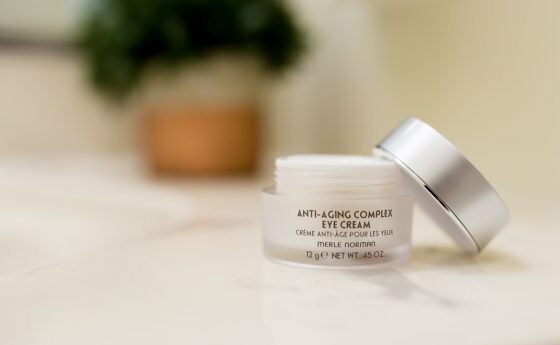 The Anti-Aging Complex Eye Cream from Merle Norman fights the signs of aging and skin dehydration with its scientifically advanced ingredients. Using special ingredients from the Antarctic Sea, this thick, luxurious cream glides onto the eye area and absorbs quickly, leaving your skin hydrated, soft, plump, and visibly brighter. Fine lines are diminished and tired-looking skin is revitalized in as little as 4 weeks. Apply to clean skin both morning and night. Gently dab the cream around the eye area. 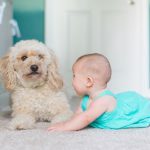 Merle Norman beauty products have been around since before your mother, but they’ve been on top of beauty trends throughout the years, providing high-quality products that consumers can stand-by generation after generation. 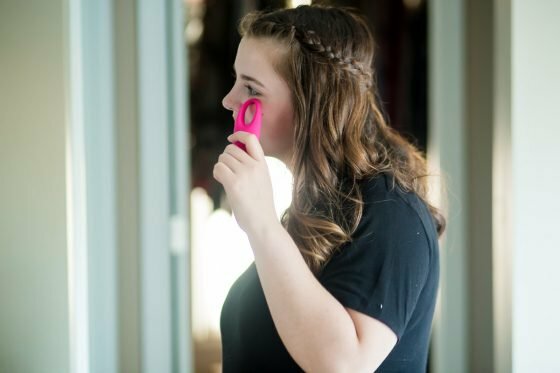 A company founded by a woman, for women – and still family owned and operated – Merle Norman believes that one makeover can change your life, therefore they only sell their products in their stores, where women can try before they buy and receive help from their professional beauty consultants, promising top-notch customer service. 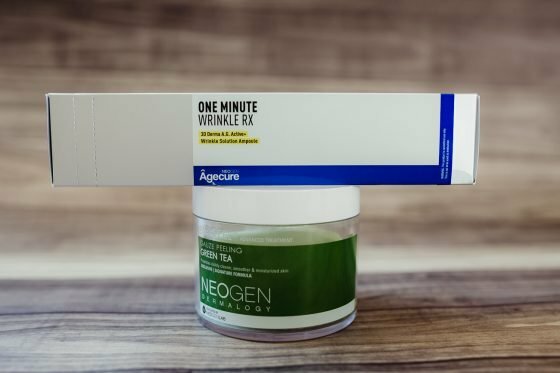 The NEOGEN Agecure One Minute Wrinkle Cream RX is an innovative wrinkle cream that instantly gives your face a lift and boost, without any needles. The serum is made up of a compound called argireline, which is a stimulator of collagen, as well as voluform, a compound that increases elasticity. 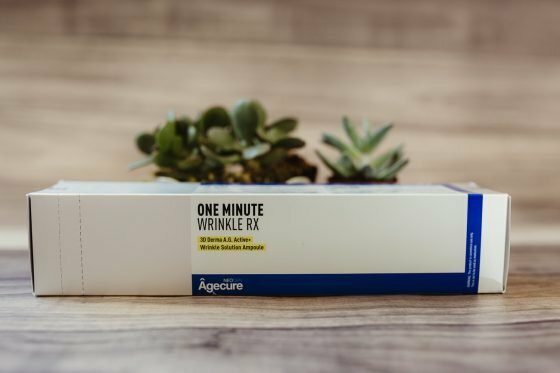 Argirelline is a synthetic amino acid derived from natural extracts, which, similar to Botox, prevents the formation of fine lines. This formula is free of benzyl alcohol, sorbic acid, and triethanolamine. Spread a thin layer over clean skin in areas as needed. 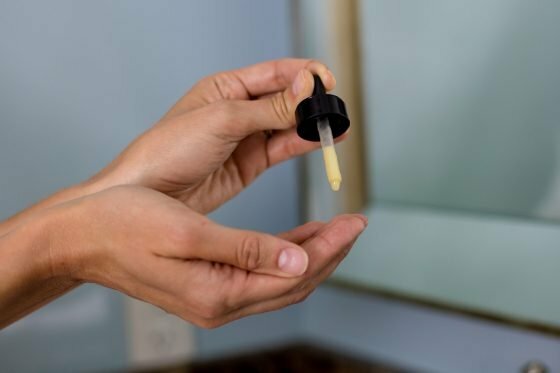 It is not recommended to apply any skin care or makeup products with high oil content after applying Agecure, as it may dilute the serum and have a diminished lifting effect. Remove at the end of the day with normal cleansers, such as an oil-based cleanser and water-based cleanser. 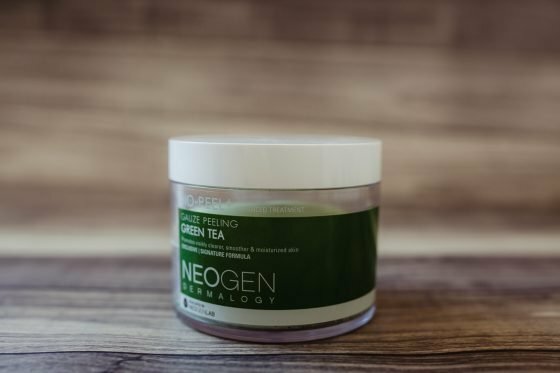 If your skin could use a refreshing pick-me-up, the NEOGEN Bio-Peel Gauze Peeling Green Tea is the perfect home peel product for you. It comes with 30 single-use exfoliating pads and it provides a gentle (yet effective!) exfoliation of dead skin cells and impurities, leaving skin smoother and clearer. Dead skin cells are sloughed off the surface of the skin using the unique 3 layer pad technology. After cleansing, slip your fingers into the sleeve of the gauze peeling green tea pad so that the criss-crossed gauze side is facing down. Use gentle, circular motions all over a dry face and neck, working your way up to your forehead. Next, rotate the pad so that the gauze side is facing up and the soft, quilted side is facing down. Swipe the softer side across the face to pick up the remaining debris. Throw away pad. Rinse with lukewarm water. In 2012, Soko Glam was created by Charlotte and David Cho, a wife and husband duo, in an effort to help customers discover new, top notch products in the Korean beauty world. The Soko Glam team travels to Seoul regularly to consult with industry experts, sift through the new skin care and makeup, and bring back the best selection of Korean beauty products for curation on Soko Glam. They are dedicated to providing you with the best beauty experience; that’s why anything you find on Soko Glam has been personally tested by Charlotte and her beauty team. They stand by the Korean “skin-first” philosophy and strive to help you incorporate it into your daily beauty routine. 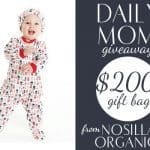 Daily Mom is always looking for the newest and freshest products out there, and that includes personal beauty lines. 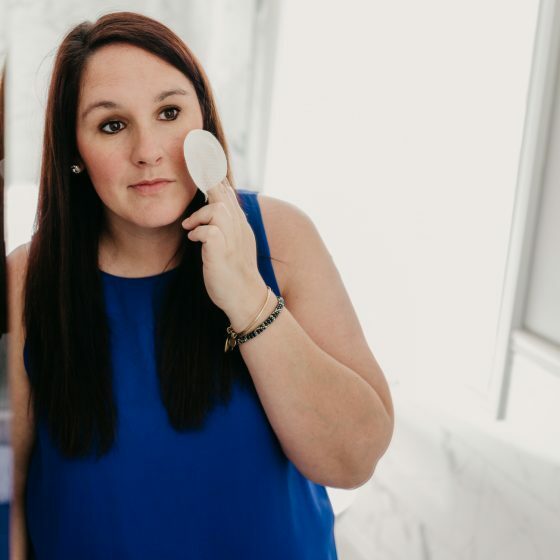 We know moms want to look as good as they feel (again, after coffee at least) and these products can help you do just that. Get soft, radiant skin with a full regimen or hit target areas with a simple serum. So say goodbye to the baking soda ritual and the traditional department store products, and say hello to the new momma’s wrinkle creams. 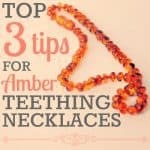 Looking for some more beauty tips? Check out Summer Beauty Essentials to get you ready this season! Next articleHow Young is Too Young for a Visit to Disney?